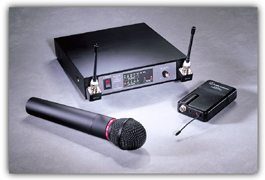 The Audio Technica 300 Series VHF wireless microphones systems represent excellent value for money for those looking for a budget priced wireless system. They both feature Versatile performance, easy operation and long-term dependability, Advanced dipole antenna system which extends operating range, and InvisibleLink® circuitry which delivers optimum sound quality, also Dual-power battery-save switches on transmitters. (Choice of frequencies available). 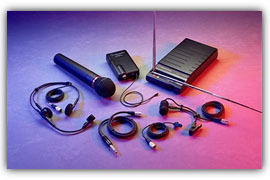 Lavalier mic, ATW-T27 UniPak transmitter & ATW-R03 receiver. ATW-R03 receiver and ATW-T28 handheld unidirectional dynamic microphone/transmitter. Headset mic, ATW-T27 UniPak transmitter & ATW-R03 receiver. ATW-R03 receiver and ATW-T27 UniPak transmitter, + AT Instrument cable with ¼" Jack. For those looking for a high quality wireless system the Audio Technica 1400 UHF Series offers true Diversity reception with two independent RF sections for greatest reliability and interference-resistant UHF band operation. Other useful features include Balanced and unbalanced audio output jacks, ground-lift switch and adjustable squelch, and Power-save switches on transmitters. MT830cW Subminiature omnidirectional Lavalier mic, ATW-R14 receiver and ATW-T51 UniPak transmitter. ATW-R14 receiver and ATW-T52 handheld unidirectional dynamic microphone/transmitter..
AT PRO8HECW Hypercardiod Headset mic, ATW-R14 receiver and ATW-T51 UniPak transmitter. ATW-R14 receiver and ATW-T51 UniPak transmitter. + AT Instrument cable with ¼" Jack.